We left Twizel at 9am to head to Lake Tekapo and the most awesome church ever - The church of the Good shepherd. Lake Tekapo has lake has 7 glaciers feeding into it - notice how blue it is. The tin shed was started as a way of local supporting each others skills. They have a great recycling thing going and has a great farm set up also. The shop had some wonderful hand craftd items. I bought a few more gifts here. The tin shed. I just loved how they had their ladies room set up - I had to take a pic. 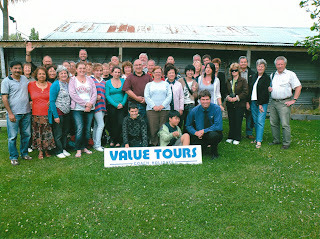 Group photo of our south Island tour party. Sing of the Takahe (a native bird) on Cashmere Hill a very affluent part of Christchurch. Was originally built as a retirement home but is now a silver service restaurant. View from Cashmere Hill lookout. A tram, church and the Canterbury Museum. Steven saying goodbye to us at our motel. He was leaving us here for our last night and he was going home to his wife. Next two photos were taken at our last dinner. Elaine & Phil Jackie, Graeme, Michelle & Lauren. Lydia & Lidwig, Bill & Jennifer, Mary, Michelle & Marilyn & Peter. After dinner Haylee, Michele, Mary & I wandered into town to attend a performance of the buskers festival. It was at the arts centre and was cmedy but not to my liking at all. Mostly sight gags and we were in seat that you couldn't really see. But we did get to see the city at night.